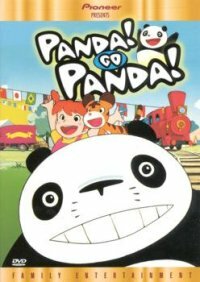 THEM Anime Reviews 4.0 - Panda Go Panda! Notes: Some names you might recognize here: the director is Takahata Isao, and the concept, screenplay, art and scenic design, and key animation are all by Miyazaki Hayao. Editor's Note: Takahata and Miyazaki worked on this series shortly after a failed attempt at creating an anime based on Astrid Lindgren's novel "Pippi Longstockings". The character design of Mimiko comes almost directly from design work that was intended for Pippi. And from that point, logic and reality seems to fly straight out the window. Even if you discount the fact that the pandas seem to be able to talk, the rest of the series gets so surreal at times, I wouldn't be surprised if Mimiko's grandmother suspects her of smoking weed based upon what she reads from Mimiko's letters. But before you get the wrong impression here, let me remind you that this is a Miyazaki series. Yes, indeed. It's another semi-fantasy tale which wouldn't be terribly surprising if it was a heavy inspiration to My Neighbor Totoro, at least if the character design and behavior pattern of the papa panda is any indication. And speaking of character design and animation, one of the first things I noticed is that this does feel pretty familiar for those who've already seen a Miyazaki feature, even though the designs themselves are somewhat pedestrian compared to his later works. They are good, don't get me wrong, but after seeing stuff like Totoro, Laputa, or even Spirited Away, this IS rather underwhelming stuff. It's a good thing, then, that beyond the slightly ear-jangling opening theme, the series develops into a rather nice, and at times, delightfully bizarre story that even borrows from old fairy tales from time to time. I picked up on the reference to "Goldilocks and the Three Bears", and one of the characters, a baby tiger, shares some of the mannerisms of Tigger from Winnie the Poho, with the pogo-tail bouncing and all. Even the main lead, Mimiko, reminded me an awful lot of Pippi Longstockings, a well known children's TV star for most Scandinavian children from a generation back up until today. I am of the impression that this animation is primarly aimed at younger children, as the first ten minutes or so presented to me material that I in my adulthood had a little trouble getting down, so to speak. The second those panda's enter the scene, though, things take on a more absurd direction. Aside from what Mimiko expects a father to act like, most which doesn't really seem to fly straight when placed upon the shoulders of a panda, there is also the issue of everyday happenings. And I gotta tell you, I admire people who can take a flood that rises up to the second floor of your house in such a calm, collected manner. So a father needs to go to work? Well, it's a good thing the zoo where the pandas used to live needed him to return. I've always wanted to see a panda punch out of work and take the subway home. And the aforementioned flood; it puts circus animals in a spot of trouble? No prob. We'll just toss the bed onto the water and use that one to paddle over. And, on another topic; who said trains needed tracks anyway? And I see no reason why you shouldn't either. Unless you demand absolutely logic or realism in your animated works, this series will most likely amuse you to no end. True, it's primarly aimed at children -- at times too much for me. But then, the minute after, it does something weird, causing me to shake my head laughing and all is well again. As for Miyazaki, if there's one thing his long run of excellent movies, series, or music videos has shown us; it's that he certainly knows what he's doing. Even from the beginning, many years before my birth even, he's been working on excellent pieces of animation with varying quality, though never below great. This isn't his best work, true, but it IS an excellent piece nonetheless.